For much of its history Canberra hasn't enjoyed the sort of glamorous reputation attached to some of its Australian peers – probably a side effect of being home to the country’s political class. Indeed, it wasn’t long after the Commonwealth Government moved from Melbourne to the nation’s new capital that it picked up the reputation as a waste of a perfectly good sheep paddock. Even today outsiders often associate the city with dull school trips where they learnt how to tell the different houses of Parliament apart though colour coding. It’s a city you have to go to, rather than one you necessarily want to visit. In reality, Canberra is a vibrant city, which is surrounded by natural beauty and a rapidly developing gourmet culture. 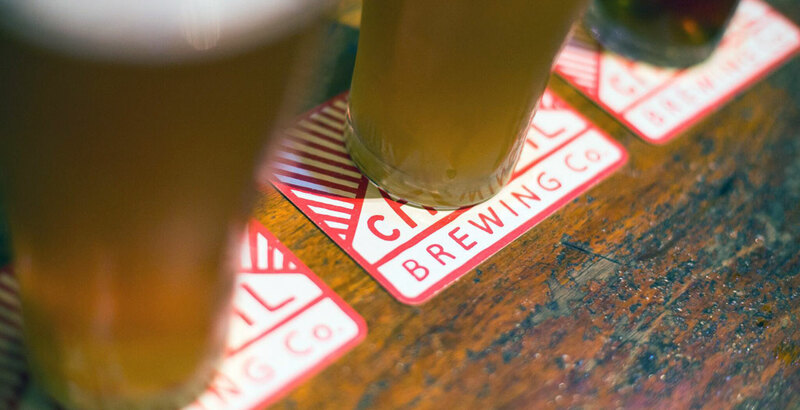 It’s those aspects of the city that Capital Brewing wants to showcase by producing beers that are connected to Canberra and its surrounds while emphasising what makes the area so great. 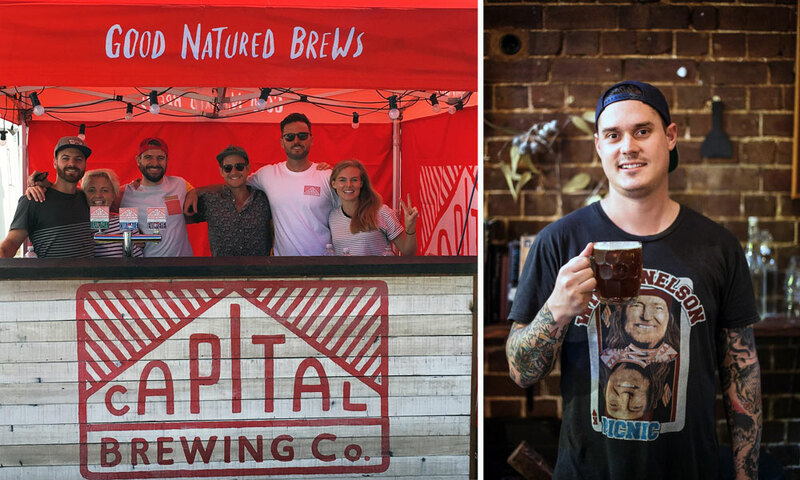 Launched in April of this year, Capital Brewing was conceived by a group of mates from different sides of the alcohol industry who felt the city could use another brewery to join the growing band made up of BentSpoke, Wig & Pen, Zierholz and Pact Beer. Those mates include Tom Hertel and Laurence Kain, who run Canberra bar Hippo (and used to run Honkytonks), and the brothers behind Batlow cider, Rich and Sam Coombes. The Coombes brothers supplied Tom and Laurence with Batlow cider and the group all got to know each other quite well, often over long chats involving beer. Eventually, those ideas developed, and the concept of starting up a brewery in the nation’s capital took hold. The rest of the crew is made up of Clare Downes (festival director of Secret Garden Festival), Nick Hislop and Ian Stott. One of the main focuses of those many alcohol-infused discussions was their love for the American beer scene, particularly what was happening on the West Coast. In fact, the Californian beer scene impressed them so much that when it came time to find a brewer they headed straight for San Diego. Considering the concept of Capital was developed by a group of mates, finding their new brewer was a little more complicated than just unearthing someone who could make good beer; they were also hiring a new friend. Quickly enough they came across Wade Hurley, who was working at Coronado after cutting his teeth at Green Flash. For Wade, moving across the world to become head brewer at a brand new venture in Australia was a pretty simple decision. “I’ve always loved to travel; Tom (Hertel) was an awesome dude,” he says. “I think it’s the best thing for my career too: I get to make the recipes myself, I get to use all these local ingredients. The Capital Brewing crew and brewer Wade Hurley (right). While Wade may have been plucked straight out of the San Diego scene, the beers themselves share a connection to Canberra, with each named after something special to the area – trait shared by many of their fellow ACT brewers. For now, their core range consists of three beers, the Coast Ale (a California Common), Trail Pale and the Evil Eye Rye, which are all named after what they love about the region. The Coast Ale was quickly agreed on as being part of the core, with the Capital team believing it was important to have an approachable beer while also feeling it was an underused style here in Australia. Trail Pale itself bridges the divide between the US and Australia, being an American style pale brewed exclusively with local hops Cascade and Galaxy; Wade is such a huge fan of the Australian bred hop that he feels you more or less have to use Galaxy if you brew in Australia. Evil Eye Red IPA was developed as an autumn seasonal and used locally grown hops, but it proved popular enough to form a part of the permanent lineup. Much like their core range, Capital Brewing want to infuse something local into their seasonal releases into the future. The start of winter (and the ski season) saw the production of First Tracks, an oatmeal and coffee stout made with local Canberra coffee roasters Barrio. Unsurprisingly, considering Wade’s background, a West Coast IPA is on the horizon, which again is likely to showcase American and Australian (as well as New Zealand) hops. One further aspect of the local region that the Capital team is particularly excited about is the ability to source locally grown hops though the Batlow Fruit Co-operative. The group already grows 10 hop varieties, one of which (US Cascade) featured in Capital’s Red IPA. Having been closely connected with the apple growers in Batlow for some time, it’s something Rich finds particularly exciting. “They (the Co-operative) did a fair bit of research into the craft beer market, and looked into the issues of hop shortages and also how much competition there was for local hops. In the US and NZ, a lot of the hop growing areas like Washington and Nelson respectively are also strong apple growing communities and regions. For the time being, their beers are gypsy brewed in Sydney (originally at Wayward, but more recently at Hairy Man Brewery) but if all goes to plan it will only be for a few more months until they get their own 20 hectolitre brewery up and running. That will be housed in a large warehouse in Fyshwick, traditionally a light industrial part of the city which has undergone something of a facelift in recent years, turning towards hospitality. To make the most of this, once the stainless in inside and beers have been made, there are plans to have a full kitchen and strong hospitality focus on site. Having come straight from San Diego, it’s possible to think that Wade might find Canberra somewhat less exciting than his previous home but he enjoys the place and has high hopes for it. “The brewing scenes pretty good up there: BentSpoke, Pact and Wig & Pen are all making really good beers. And they’ve all been really supportive instead of coming at us from a competitive angle," he says. Not bad at all for a sheep paddock. UPDATE: As of September 9, 2017, Capital has a brewery and Tap Room at Building 3/1 Dairy Rd, Fyshwick. Keep tabs with all things Capital Brewing via its Facebook page.